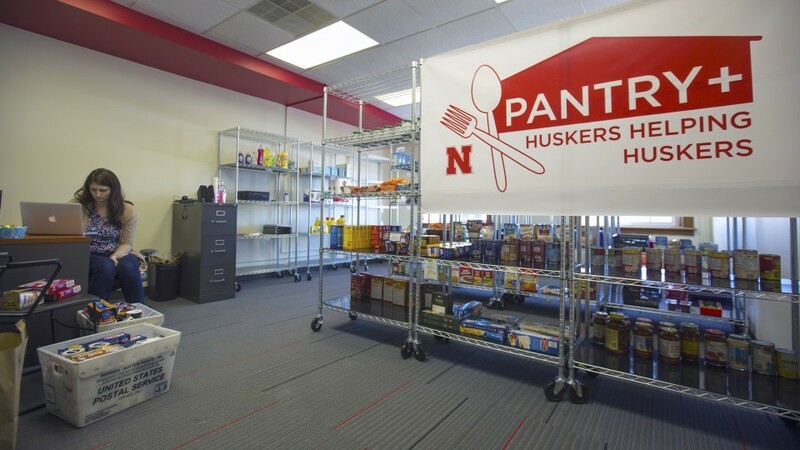 The Huskers Helping Huskers Pantry+, a food pantry for students, is in the Nebraska Union, Room 348. Lincoln, Neb. — The CASNR community contributed over 1,100 items to the Huskers Helping Huskers Pantry+ during its food drive March 4-6. The food drive was part of a weeklong celebration of students, faculty, staff and alumni of the College of Agricultural Sciences and Natural Resources at the University of Nebraska–Lincoln. The food drive benefited the Huskers Helping Huskers Pantry+, a one-stop, on-campus location to support students in need of food. Several food donation bins were placed throughout campus with departments, and graduate and undergraduate programs associated with each division. Division five collected 334 items to win the competition. That division was made up of the graduate and undergraduate programs from biochemistry, food science and technology, food technology for companion animals, mechanized systems management, biological systems engineering, agricultural engineering and microbiology. For their efforts, the division will have a brick laid in the Legacy Courtyard on East Campus in a new area designated for CASNR Serviceship. In addition to the food drive, CASNR Week featured a blood drive, community night for local elementary schools, a lunch for students, faculty, and staff, and an ice cream social.